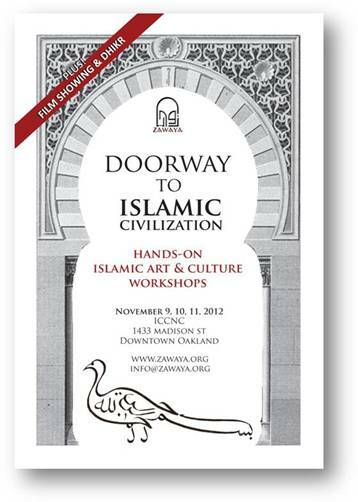 Zawaya thus launches an original event: "Doorway to Islamic Civilization", a weekend collection of hands-on workshops on Islamic art and culture set against the current social backdrop of Islamophobia. These workshops are meant to give those interested the opportunity to get to know Islam and Muslims by providing a safe space within which to explore and experience the Islamic sense of beauty embodied in art, crafts, music, architecture, and more. In addition to the workshops, there will be a film showing of "Islamic Art: Mirror of the Invisible World" followed by a panel discussion between the filmmaker, Michael Wolfe, and Islamic art and architecture experts. The Mevlevi Order of America will also be present to offer a Dhikr (a devotional act) by Mevlevi musicians and dervish turners. Workshops are categorized into: Art & Architecture, Arts & Crafts, Calligraphy, Lifestyle & Culture, Music, Writing, and Youth (5-15 years old). This event is co-sponsored by The Afghan Coalition, The Arab Cultural and Community Center of San Francisco (ACCC), Arab Resource and Organizing Center (AROC), Aslan Media, The Center for Islamic Studies at the Graduate Theological Union (GTU)in Berkeley, Council on American-Islamic Relations (CAIR-SFBA), Interfaith Coalition for Immigrant Rights (CLUE CA), Islamic Cultural Center of Northern California (ICCNC), Islamic Network Group (ING), and Ziya Art Studio. 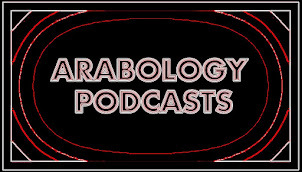 Zawaya Film Showing: "Islamic Art: Mirror of the Invisible World"
Workshop AC6: Intro to Islamic Ceramics: Make Your Own! 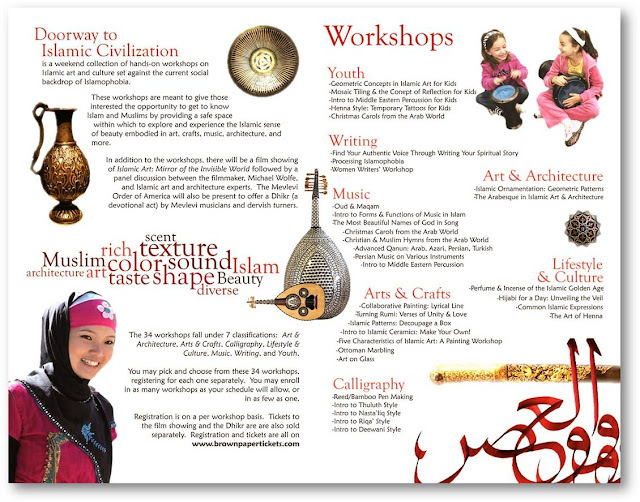 Workshop Y1: Geometric Concepts in Islamic Art for Kids! Workshop Y3: Intro to Middle Eastern Percussion for Kids! Workshop Y2: Mosaic Tiling and the Concept of Reflection for Kids! Workshop Y4: Henna Style: Temporary Tattoos for Kids!